I are counting down the days until I can splash around in a swimming pool, live in Havaianas and sip paloma’s midday. (read: summer). Until then, I’m transitioning my winter white skin from washed out to subtly tinted, because lets face it: full-on bronze looks best when paired with cutoffs and sunshine. For a glowy, naturally believable base, I start with an all-over self tanner. I recently discovered and fell in love with Canadian brand Pretend Tan. Their deliverance of a streak free and natural tone is yes, their easy-to-use spray and mousse formulas that truly deliver an even shot of golden colour, but also their pre-tanning formula, which is the super secret weapon. The enzyme exfoliator, which is paraben-free like all Pretend Tan products, is a “highly effective enzyme exfoliating treatment for the face and body. It creates visibly smoother, clearer and clean skin and leaves skin looking instantly revitalized, smooth and healthy.” The truly delicious pineapple scented lotion removes dead skin cells gently and effectively, making a perfect and smooth base for tanning. Bonus: Pretend Tan’s tanning mitt is black and velvety, which feels amazing to use, helps ensure a perfect application, saves your palms from turning orange and doesn’t absorb formulas and stain, making it luxurious and reusable more so than other mitts. 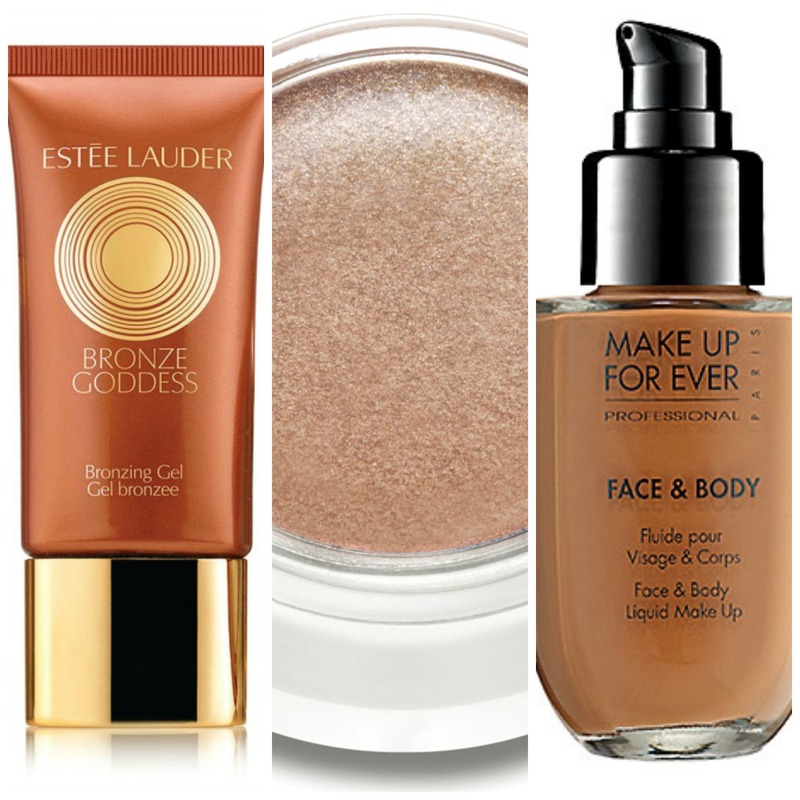 To further assist in a natural-looking glow, I love a good bronzer in anything but a powder formula; a healthy, fresh-faced radiance is easily achieved with a creamier texture. Topping my list for scoring a sun-kissed glow is RMS Beauty’s Buriti Bronzer. First of all, this bronzer is true to the brand’s artistry of using organic and super-good-for you ingredients, and is formulated with “wild crafted Buriti oil, the highest oil in Vitamin A and Beta-carotene known to man”. The best part is that it looks as good as it is for you — the sheer, buildable and creamy formula blends seamlessly into skin, is the perfect shade of warm bronze (no orange or pink tones!) and has the slightest amount of luminizer to create a perfectly bronzed, radiant complexion. For a deeper tint, I absolutely adore Estée Lauder‘s limited-editon Bronze Goddess Bronzing Gel. The perfect punch of colour, this hydrating and smoothing formula has a beautiful, luminous finish. Applied with a damp sponge, this gel delivers a truly natural result that subtly shimmers for a bronzed tone that looks like a vacation in Tahiti in a bottle. Almost as uplifting is the beautiful and lavish packaging in the brand’s signature gold tone. When I’m looking for a slight depth in colour with a matte finish, I reach for French cult-favourite brand Make Up Forever‘s Face and Body Liquid Makeup. The ultra light-weight and waterproof formula is a water-based gel, making it incredibly easy to blend. Providing a totally natural, satin-smooth finish, I use a shade a few tones darker than my current -colour foundation and simply smooth over anywhere I want a touch of colour, like the hollows of my cheeks, above my brow bones and down the sides of my nose for a natural bronzy and subtly contoured look. ← Sip Sip: Our Favourite Gorgeous Spring Cocktails are Actually Good for You!